Her married name was Richardson. Mary (Polly) Chaulk was christened on 17 January 1875 at St Peters Church, Great Haseley, Oxfordshire. She appeared on the 1881 Census in Great Haseley, Oxfordshire, and William Chaulk, Mary Thorn, Ellen Chaulk, Ann Chaulk and Alice Chaulk were living in the same household; William the head is described as a carter. Alice is described as grandaughter born Thame. 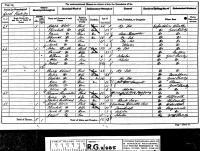 Mary (Polly) Chaulk appeared on the 1891 Census in, Little Haseley, Oxfordshire, , and Mary Thorn, Alice Chaulk and William Chaulk were living in the same household; William is described as a farm labourer. Alice is a granddaughter. Mary (Polly) Chaulk married (?) Richardson. (?) Richardson married Mary (Polly) Chaulk, daughter of William Chaulk and Mary Thorn. 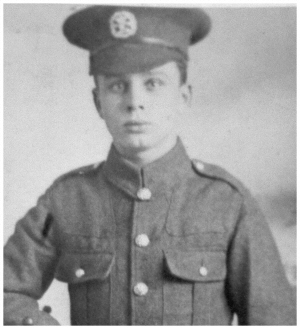 Harold A. Gathercole married Annie Chaulk, daughter of Thomas Chaulk and Elizabeth Catherine Williams, in 1916. Her married name was Chaulk. Ann Cottrell married William Chaulk circa 1816 at Berrick Salome, Oxfordshire. Her married name was Chaulk. Mary Gurden married William Chaulk on 4 September 1836 at St Peters Church, Great Haseley, Oxfordshire. Mary Gurden appeared on the 1841 Census and William Chaulk, Anna Maria Chaulk, John Chaulk and William Chaulk were living in the same household; William (Snr) the head is described as an ag. lab. 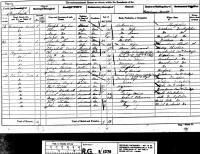 Mary Gurden appeared on the 1851 Census in, Little Haseley, Oxfordshire, , and William Chaulk, John Chaulk and William Chaulk were living in the same household; William and his sons were Ag Lab's. Mary Gurden appeared on the 1861 Census in Great Haseley, Oxfordshire, and William Chaulk were living in the same household; William the head is described as an ag. lab (despite his age of 71 years at the time). Harriet Chaulk was christened on 12 July 1818 at, Little Haseley, Oxfordshire, . She died circa 1818 at, Little Haseley, Oxfordshire, . Joseph Chaulk was christened on 5 December 1819 at Great Haseley, Oxfordshire. Anna Maria Chaulk was christened on 3 February 1822 at Great Haseley, Oxfordshire. She appeared on the 1841 Census and William Chaulk, Mary Gurden, John Chaulk and William Chaulk were living in the same household; William (Snr) the head is described as an ag. lab. Mary Chaulk died circa 1826 at, Little Haseley, Oxfordshire, . She was christened on 17 September 1826 at Great Haseley, Oxfordshire. John Chaulk was christened on 25 December 1828 at Great Haseley, Oxfordshire. He appeared on the 1841 Census and William Chaulk, Mary Gurden, Anna Maria Chaulk and William Chaulk were living in the same household; William (Snr) the head is described as an ag. lab. 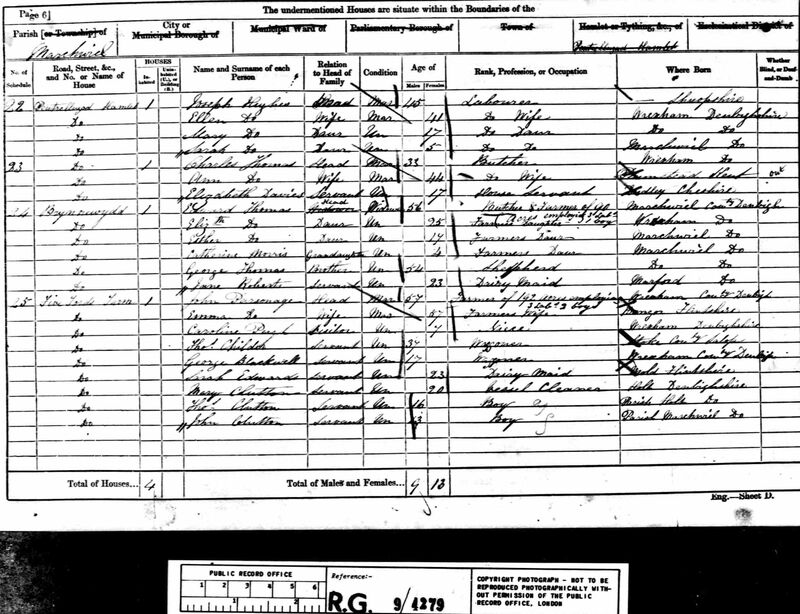 John Chaulk appeared on the 1851 Census in, Little Haseley, Oxfordshire, , and William Chaulk, Mary Gurden and William Chaulk were living in the same household; William and his sons were Ag Lab's. John Chaulk married Harriet Wilks, daughter of Robert Wilks, on 9 April 1854 at St Peters Church, Great Haseley, Oxfordshire. John Chaulk appeared on the 1861 Census in Great Haseley, Oxfordshire, and Harriet Wilks, William Charles Chaulk, John Chaulk and Robert Chaulk were living in the same household; John the head was described as an ag. lab. John Chaulk appeared on the 1871 Census in Great Haseley, Oxfordshire, and Harriet Wilks, William Charles Chaulk, John Chaulk, Robert Chaulk, Rhoda Chaulk, Henry Chaulk and Thomas Chaulk were living in the same household; John the head was described as an ag. lab. as are his sons William, John and Robert. John Chaulk died in 1881 at, Little Haseley, Oxfordshire, . He was buried on 9 March 1881 at Great Haseley, Oxfordshire. Marriage* He married Harriet Wilks, daughter of Robert Wilks, on 9 April 1854 at St Peters Church, Great Haseley, Oxfordshire. Her married name was Chaulk. Harriet Wilks was born circa 1837 at Milton under Whychwood, Oxfordshire. She married John Chaulk, son of William Chaulk and Ann Cottrell, on 9 April 1854 at St Peters Church, Great Haseley, Oxfordshire. 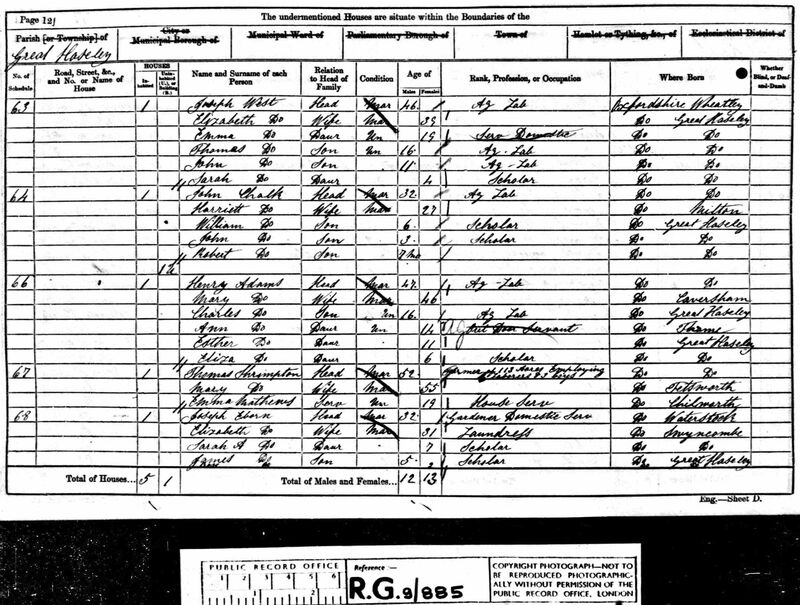 Harriet Wilks appeared on the 1861 Census in Great Haseley, Oxfordshire, and John Chaulk, William Charles Chaulk, John Chaulk and Robert Chaulk were living in the same household; John the head was described as an ag. lab. 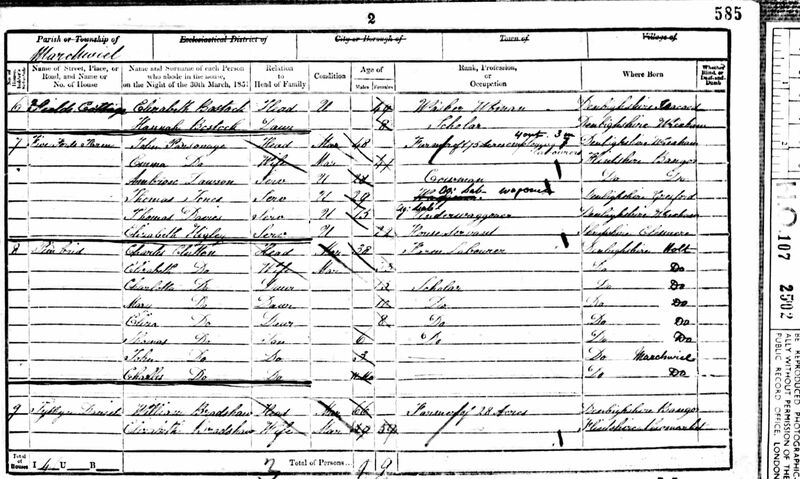 Harriet Wilks appeared on the 1871 Census in Great Haseley, Oxfordshire, and John Chaulk, William Charles Chaulk, John Chaulk, Robert Chaulk, Rhoda Chaulk, Henry Chaulk and Thomas Chaulk were living in the same household; John the head was described as an ag. lab. as are his sons William, John and Robert. 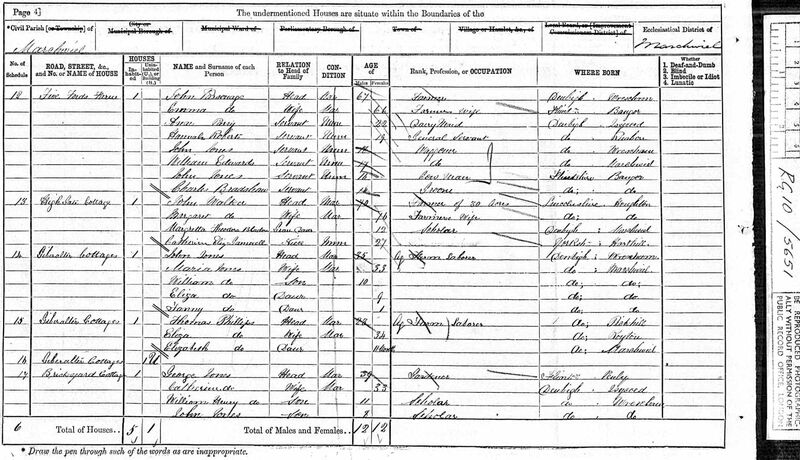 Harriet Wilks appeared on the 1881 Census in Great Haseley, Oxfordshire, and John Chaulk, Robert Chaulk, Henry Chaulk, Thomas Chaulk and Maria Chaulk were living in the same household; Harriet the head, and a widow, was described as an agricultural labourer, as were her children John, Robert and Henry. Thomas Parsonage was baptised at Gresford, Denbighshire. He was born on 27 December 1762 at Gresford, Denbighshire. He witnessed the will of Timothy Parsonage on 19 April 1780; In his will Timothy bequeaths the profits of his farm to his wife Elizabeth & his sons Thomas and Timothy, and to William Parsonage of Lower Hall. He also names these as executors of his will. He leaves his lands, messuages, household goods and stocks to be divided equally amongst his children. The will was witnessed by John Thomas, John Bennion and Thomas Bennion. It was proved at St Asaph on March 8th 1781. The estate was sworn to be valued above £100 and below £300. It is not known if the farm referred to is Trevalyn Farm. Thomas Parsonage married Mary Price in 1794 at Gresford, Denbighshire, and the ceremony was witnessed by Richard Price, James Price and Ester Pover. There is a Thomas Parsonage, yeoman, son of Timothy late of Allington who was made Freeman of the City of Chester on 10th October 1795. cf his father was also probably made a Freeman and his father's brother Samuel. Thomas Parsonage left a will dated on 6 June 1818; just four months before his death. He is described as a farmer of Allington. He bequeaths £300 to his daughter Mary (who in 1819 marries Thomas' brother Timothy's son, another Timothy). Thomas names his wife, daughter Mary and nephew Timothy as his executors. Timothy later takes the oath of executor on 24th May 1819 (two weeks after marrying Mary). He died on 30 September 1818 at Gresford, Denbighshire, at age 55. He was buried after 30 September 1818 at, Gresford, Denbighshire, ; Thomas is buried in a large box tomb next to the pathway leading to the North entrance to the church. There are eleven other Parsonage relatives mentioned on this tomb. Marriage* He married Mary Price in 1794 at Gresford, Denbighshire, and the ceremony was witnessed by Richard Price, James Price and Ester Pover. Her married name was Parsonage. Mary Price was born circa 1765. She married Thomas Parsonage, son of Timothy Parsonage and Elizabeth Parsonage, in 1794 at Gresford, Denbighshire, and the ceremony was witnessed by Richard Price, James Price and Ester Pover. Mary Price died on 30 November 1832. She was buried after 30 November 1832 at, Gresford, Denbighshire, ; Mary is buried in a large box tomb next to the pathway leading to the North entrance to the church. There are eleven other Parsonage relatives mentioned on this tomb, including her husband Thomas. Jonathon Parsonage married (?) (?). John Parsonage was born on 8 July 1792 at, Isycoed, . He died on 11 July 1803 at age 11. He was buried after 11 July 1803 at, Gresford, Denbighshire, ; There is a box tomb next to the south facing wall of the church which is amongst other Parsonage graves. The inscription is badly worn but it is possible to see the date 11th July 18--. It is possible that this is the grave of John. Ellinor Parsonage was born on 5 August 1794 at Wrexham?, Denbighshire. She was baptised on 21 November 1794 at Wrexham, Denbighshire. She died on 26 February 1811 at age 16; Ellinor is buried in a large box tomb next to the pathway leading to the North entrance to the church. There are eleven other Parsonage relatives mentioned on this tomb, including her father Timothy. Elizabeth Parsonage was born on 30 December 1800. She was baptised on 18 September 1804 at Wrexham, Denbighshire. John Parsonage was born on 17 September 1803. He was baptised on 18 September 1804 at Wrexham, Denbighshire. He married Emma Smith, daughter of James Smith and (?) (? ), in 1845 at Wrexham, Denbighshire. John Parsonage appeared on the 1851 Census in, Denbighshire, , and Emma Smith were living in the same household; John is described as a farmer of 75 acres, also present were John's wife Emma and four workers. John Parsonage appeared on the 1861 Census in, Denbighshire, , and Emma Smith were living in the same household; John was a famer of 192 acres with five workers. His wife Emma was also present and a neice Caroline Pugh aged 9 years. John Parsonage appeared on the 1871 Census in, Denbighshire, , and Emma Smith were living in the same household; John and Emma had six workers living with them. John Parsonage died on 16 April 1872 at age 68. He was buried after 16 April 1872 at, Gresford, Denbighshire, ; John is buried in a large box tomb next to the pathway leading to the North entrance to the church. There are eleven other Parsonage relatives mentioned on this tomb. 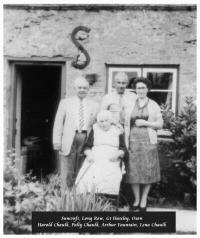 He left a will dated after 16 April 1872 at Five Ford Farm, Marchwiel, Denbighshire; The will was proved by Emma his wife and she was the sole beneficiary. Marriage* He married Emma Smith, daughter of James Smith and (?) (? ), in 1845 at Wrexham, Denbighshire. Her married name was Parsonage. Emma Smith was born circa 1804. She married John Parsonage, son of Timothy Parsonage and Phoebe Lloyd, in 1845 at Wrexham, Denbighshire. Emma Smith appeared on the 1851 Census in, Denbighshire, , and John Parsonage were living in the same household; John is described as a farmer of 75 acres, also present were John's wife Emma and four workers. Emma Smith appeared on the 1861 Census in, Denbighshire, , and John Parsonage were living in the same household; John was a famer of 192 acres with five workers. His wife Emma was also present and a neice Caroline Pugh aged 9 years. Emma Smith appeared on the 1871 Census in, Denbighshire, , and John Parsonage were living in the same household; John and Emma had six workers living with them. Emma Smith died on 9 January 1875. She left a will dated after 9 January 1875; The abstracts of her will shows that Emma left a will which was proved 22 January 1875 by her nephew Edward Smith. It gave her address as Five Fords Farm, Marchwiel / High Street, Wrexham. It showed High Street as being the place of her death. The estate was valued under £800. (There is an Edward Smith recorded on the 1881 census at 26 High Street, Wrexham. He and a number of his family are drapers, it may be that this was a drapers shop at the time.). She was buried after 9 January 1875 at, Gresford, Denbighshire, ; Emma is buried in a large box tomb next to the pathway leading to the North entrance to the church. There are eleven other Parsonage relatives mentioned on this tomb, including her husband John. Marriage* She married John Parsonage, son of Timothy Parsonage and Phoebe Lloyd, in 1845 at Wrexham, Denbighshire. James Smith married (?) (? ).